Jacqui went to the Newcastle Region Libraray for the presentation night and launch of the Newcastle Short Story Prize Anthology, in which her neice Natalie Petrohelos has her shortlisted story Ever So Gently published. Very proud of her lovely story. Literary Competitions and Impressing the Judges was the topic of the workshop Jacqui gave to FAW North Shore, at Wallarobba House in Hornsby. Lots of questions and lively discussion made the afternoon enjoyable for everyone. Thanks to Richard and Maria for organising the visit. ABC Regional Radio interviewed Jacqui on air, as part of their book show. As part of the interview, Jacqui read her story In Flames. Great Lakes FAW invited Jacqui back to give a workshop on Self-editing at the Forster Memorial Services Club. Again, the members were keen to tackle all the exercises, including being given the world's most boring story to edit. Thanks again to Hermione. After unfortunately getting lost in the lovely beachside suburbs of Port Stephens, resulting in a late arrival, Jacqui was made most welcome by the very understanding members of Port Stephens FAW. The workshop was an introduction to writing short story and everyone participated very enthusiastically. Lunch afterwards was a fine way to wind down and get to know each other. Thanks to Christine for organising the workshop. The Short Story Toolbox was the title of the workshop Jacqui gave to Eastwood/Hills FAW. It was great to be back with old writing friends and to discuss some deeper concepts of short story writing. Another full day of workshops for Central Coast FAW, to extend the previous workshop on Pace & Impact. Participants developed new stories as well as working on stories brought to the workshop. Thanks to all the enthusiastic participants. Myall U3A hosted a writing workshop by Jacqui on Short Story, with a very entertaining lunch afterwards. Thanks everyone. A return visit to North Arm Cove FAW, where Jacqui gave a workshop on Dialogue and Action. Some lively discussion and a very welcoming time. Thanks to Maureen Kelly for inviting me back. At the Memorial Services Club Forster, Jacqui gave a workshop on Conflict in Writing to the Great Lakes FAW. Once again, it was very enjoyable to see familiar faces and have fun setting up some very imaginative conflicts for future stories. Thanks again to Hermione Browning for inviting me to speak, not to mention buying me lunch! With a beautiful backdrop of Hallidays Point Beach from Blackhead Surf Club, Jacqui gave a talk on the writing process to Hallidays Point Probus. Thanks for a great welcome. Hunter FAW hosted one of Jacqui's workshops at the Sydney Junction Hotel, Newcastle. The topic was Pace and Impact for a Compelling Read. Thanks to all the enthusiastic participants. Jacqui ran a whole day of writing workshops for Central Coast FAW, covering Structure, Dialogue and Action, and Pace and Impact in story. Everyone enjoyed all the writing exercises and there were some very talented contributions from participants. Thanks to all who organised the day. Jacqui took her eldest two grandsons, Joel and Nathan, to stay overnight at the Powerhouse Museum in Sydney for the Writer Overnighter with author Morris Gleitzman. As well as talking to the children about writing, Morris read one of his new stories and sent the children on an invisible ink trail around the museum, to discover lots of interesting objects and the funny stories in invisible ink that he had written about the objects. Lots of fun - but not much sleep! Jacqui and fellow-writer John Davies went to the Gloucester Writers Festival. At the Waverley Library, Jacqui ran a workshop on Narrative Voice for Bondi Writers. Lots of very enthusiastic questions and responses. 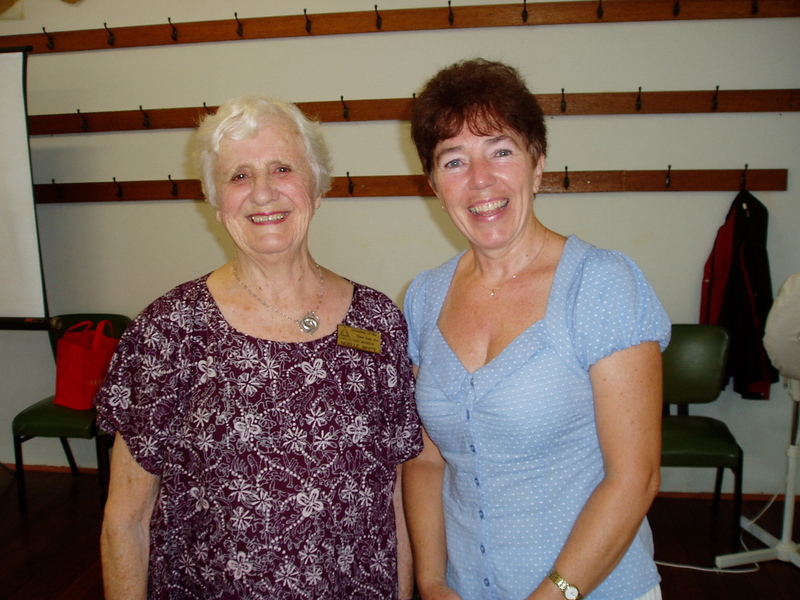 Jacqui gave a talk to Forster/Tuncurry U3A on writing short story and getting published. One of the participants, Noelle, has just published a memoir of letters from the post-WW2 era. Myall U3A hosted a talk by Jacqui at Tea Gardens. It was great to see some familiar faces from the North Arm Cove FAW group amongst the crowd. North Arm Cove FAW enjoyed a workshop run by Jacqui, on narrative voice. Thanks to Maureen Kelly and all at North Arm Cove for organising a great afternoon. The Gloucester Chill Out Festival saw Jacqui and children's author John Davies running a Writers @ Work display, outside Books & Beans cafe. Throughout the day, Jacqui and John were writing on site, with their work displayed on a large screen, to give festival-goers a taste of how writers go about the craft of writing. Jacqui and John are very grateful to Louise, from Books & Beans, for all her support and the great coffee. Jacqui ran workshop on Writing Humour for the Great Lakes Fellowship of Australian Writers, at the Forster Memorial Services Club. Jacqui would like to thank Hermione Browning for organising her third workshop with this enthusiastic group of writers. Jacqui gave a workshop to Gloucester U3A writers, on finding the voice of the narrative. Thanks to Marg Collett, for inviting Jacqui to give this workshop to a talented bunch of writers. The book launch of Scribbles, a selection of short stories, poems, memoirs and cartoons, by Manning Valley authors was held at the Manning Art Gallery, as part of the Manning Winter Festival. Jacqui was editor-in-chief of Scribbles and has three stories and three poems included in the anthology. The book launch was a great success, with MC Antony Zanos from 2RE and guest speaker Daniel Scott, travel writer for the Sydney Morning Herald. The Sydney launch of Jacqui's collection of short stories Salt & Pepper was held at Berowra Community Centre on Saturday November 21st 2009. As well as opening music from Paul Winn and a launch speech from David Terelinck, the audience sat back to hear readings from the new book as well as a sneak preview of a story to be released in Jacqui's next book. Thanks to everyone who helped and everyone who came - it was a great afternoon. Jacqui's new book of short stories Salt & Pepper had its country launch at Great Lakes Library, Forster. A fine crowd of people from as far away as Port Macquarie and Sydney gathered to hear Jacqui read selections from the short story collection and to celebrate the book's release with wine and food. Jacqui is very grateful to John Davies who did a fantastic job launching the book and reading one of the humorous stories from the book. Thanks to everyone who came and everyone who helped to make this country launch such a success. At the annual Nabiac Village Fair, a stall for Mid North Coast Authors was held by authors Kate Loveday, Anita Forbes and Jacqui Winn. In spite of the wind and dust, we managed some book sales and we also gave away a free short story from Jacqui's first book and a chapter from Kate's second book. Lots of enthusiastic readers were very happy to take their freebies away for a quiet read at home. Jae Bees Restaurant in Nabiac held a local arts day, featuring works from many local artists as well as books by Kate Loveday and Jacqueline Winn. Jacqui and Kate signed books and gave away free 'mini books' containing a single story, which were very much appreciated by all Jae Bees customers. They enjoyed meeting visitors from as far away as Melbourne and catching up with the locals. Thanks go to Justine of Jae Bees for organising the arts day. Jacqui gave a talk to the very enthusiastic Hunters Hill Seniors Friendship group on writing short story. Jacqui is very grateful to Cecily Abramson for organising the day. Jacqui gave a workshop on Character to Taree Scribblers at the Taree Library. Jacqui attended the Eastwood/Hills FAW presentation afternoon, where she received a 1st prize, a Highly Commended and a Commended for the short story category of the Eastwood/Hills FAW National Literary Awards as well as a 2nd prize in the memoir category. Jacqui read her story In Flames at the launch of Award Winning Australian Writing 2009 at the Melbourne Writers' Festival in Federation Square. In Flames won the Henry Lawson Gulgong short story award in 2008 and was chosen to be published in this prestigious anthology. The launch was packed to overflowing and there was plenty of time afterwards to get to know the other writers who appear in the book as well as publisher David Tennenbaum and editors Marleen and Adolpho of Melbourne Books. Award Winning Australian Writing 2009 is an anthology of short stories and poetry from thirty-nine authors, all of whom won awards for their work in 2008. The book is available in bookstores. Jacqui gave a seminar to Great Lakes FAW on The Publishing Challenge. Thanks to Hermione Browning, President of the branch, who organised Jacqui's visit and generously bought her lunch beforehand. Mid North Coast Authors had a stand at the Taree Arts Expo in the Manning Art Gallery, where Jacqui had her books on display with other local authors. Jacqui gave a workshop to Taree Scribblers on writing the Compelling Narrative. Jacqui read an exerpt from Kate Loveday's new book An Independent Woman, during the launch of the book at the Back to Bulahdelah festival. Years 5 to 8 at Wyong Christian Community School were given a day of workshops on How to Start a Story by Jacqui. At Taree Scribblers, Jacqui gave a seminar on writing The Compelling Narrative. At the Literacy Lunacy morning in Forster, Jacqui read two of her humorous poems The Problem Weed and What's for Dinner, Love? The poetry celebration was part of the Forster Baby Boomers Bash. Jacqui ran a day of workshops on How to Start a Story for Years 9 to 12 at Wyong Christian Community School. Jacqui gave a seminar on Self Editing to Taree Scribblers. At Eastwood/Hills FAW, Jacqui gave a seminar on Self Editing. With authors Kate Loveday and Anita Forbes, Jacqui ran a market stall at the Blackhead Bazaar for Mid North Coast Authors, an authors' co-operative that promotes and markets local authors on the Mid North Coast of NSW. 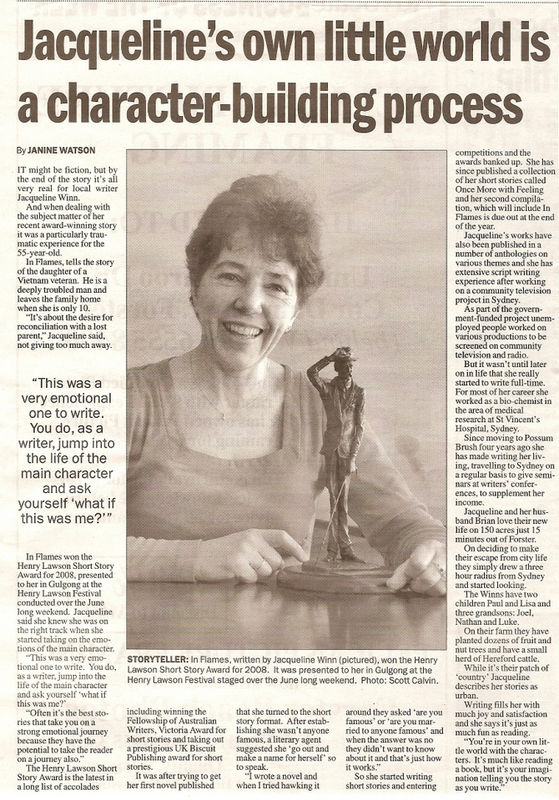 Great Lakes Advocate published an article on Jacqui's Henry Lawson short story award. Jacqui attended the Henry Lawson Festival at Gulgong, NSW. At the Presentation evening on Saturday night, Jacqui was presented with a statuette of Henry Lawson and a cheque, as first prize in the Henry Lawson Short Story Award for her story In Flames.